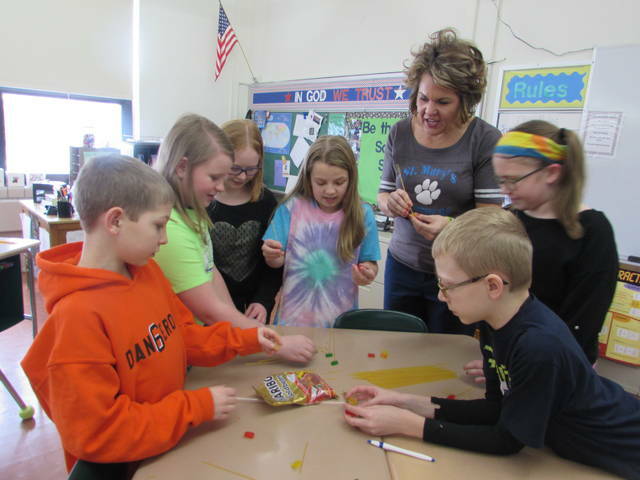 Clockwise from left are St. Mary’s school fifth graders constructing a church out of spaghetti noodles and gummy bears, Kylee Schroeder, Sarah Maag, Peyton Schroeder, Kendal Schroeder, Principal Michelle Knippen, and students Kendal Spoors and Carson Schroeder. LEIPSIC — Catholic Schools Week is being celebrated locally by St. Mary’s School in Leipsic this week by students participating in numerous activities to learn about service before self. Michelle Knippen, St. Mary’s School principal, said the school held an open house Sunday attended by 200 students and their families. She said she hopes the student who are in pre-kindergarten through eight grade learn about teamwork and serving one another. “It’s so important to recognize the accomplishments of what we do here in school, but also recognize that we can pray, serve and lean together,” according to Knippen. The seventh and eighth graders made wax museums where they dressed up as Jesus, Abraham Lincoln and Johnny Appleseed and talked about the person’s life after doing research. The fifth and sixth graders did a Science Technology Engineering and Math project and the third and fourth graders talked about the tundra. Kindergarten, first and second graders did STEM activities where they had a marble and took a toilet paper roll and dropped the marbles through it. Modeling clay also was used to create boats to see if their boats could float by putting pennies in their boats. Students also made houses out of toothpicks and marshmallows and took a hairdryer to see if the big bad wolf could blow the imaginary house over. On Monday the students finished up their Penny War where they raised $1,141 that will go the Heartbeat of Putnam County. The organization accepts donations of clothing for babies of expectant mothers. The school’s eighth graders will visit the organization today to present the donations. Each grade level on Tuesday were given spaghetti noodles and gummy bears with the goal to create a church. “We talked about how it takes pews and the people to make a church and if something breaks we have to support one another to fix it and build each other up,” Knippen said. Fifth grader Carson Schroeder worked with other students to construct a church. “I like making things out of food and like going to school here because I learn about Jesus,” Carson said. Kylie Shroeder, who also is a fifth grader, said she has learned during the week how to work with her classmates. “When we were in chapel, someone forgot the words so we stepped up to help them,” Kylie said. Sarah Pester, eighth grade homeroom and language arts teacher, said the week brings unity among all the schools across the nation. “Everyone can celebrate our Catholic schools together. We are talking about priests’ and sisters’ roles and other vocations in the church,” Pester said. Eighth graders also wrote essays about why they like going to a Catholic school, and one of the responses was the openness to pray. Students will travel to Columbus Grove’s St. Anthony Church and have Mass with the school and students from Ottawa’s St. Peter and Paul School. 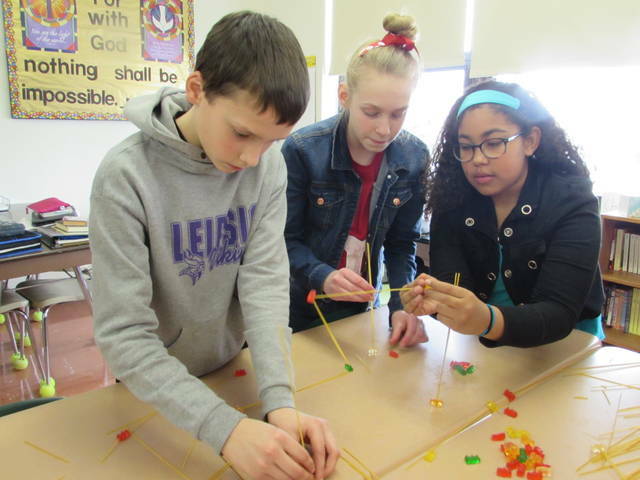 https://www.limaohio.com/wp-content/uploads/sites/54/2019/01/web1_IMG_2030.jpgClockwise from left are St. Mary’s school fifth graders constructing a church out of spaghetti noodles and gummy bears, Kylee Schroeder, Sarah Maag, Peyton Schroeder, Kendal Schroeder, Principal Michelle Knippen, and students Kendal Spoors and Carson Schroeder.